Join hundreds of students and teachers around the world who have downloaded and enjoyed this easy and engaging way to learn and master the IPA chart and its symbols. 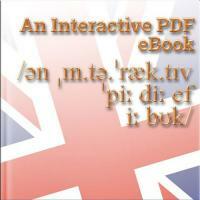 I use this eBook with all of my online students when we are looking at accent reduction and an improvement of their British English pronunciation. The IPA chart is an essential cornerstone for anyone wishing to perfect their British English accent. Because it’s so important, and because teaching it demands a considerable amount of teaching time and expense, I decided to write this eBook to make it as easy and cheap as possible for anyone, teacher or student, to get to grips with the British English IPA chart and use it effectively. If you learn the 44 symbols of the British English IPA phonemic chart, you will always be able to pronounce any word correctly with the use of a good dictionary. After a decade teaching phonetics to students and teachers alike, I saw a need for this Interactive PDF format book. It will help you to learn the chart, and also to reproduce the correct sounds for each of the 44 symbols. Never again will you be afraid that you are going to mispronounce a word. The eBook contains over 80 hyperlinked pages and hundreds of audio files which you can listen to without having to leave the PDF document as they are embedded in the pages. Each page also contains an interactive IPA chart, which makes it simple to navigate to the pages for any of the 44 symbols and sounds with the click of a mouse. You are never more than a single click away from the sound you want to practice. Please check that the PDF files work correctly for you by choosing the Try Before You Buy link. Due to the nature of digital products, refunds cannot be given once the file has been downloaded. Check this page if you are a Mac user not a PC user.